The paintings of Mikhail Fedorovich depict everyday scenes of provincial and soldier life. Due to the fact that the painter had served time in camps more than once, he studied with interest and enthusiasm the drawings and inscriptions of soldiers on the walls of the barracks. Afterwards, they will find their place in the soldier’s series of paintings created by Larionov, many of which will become classics of Russian art. 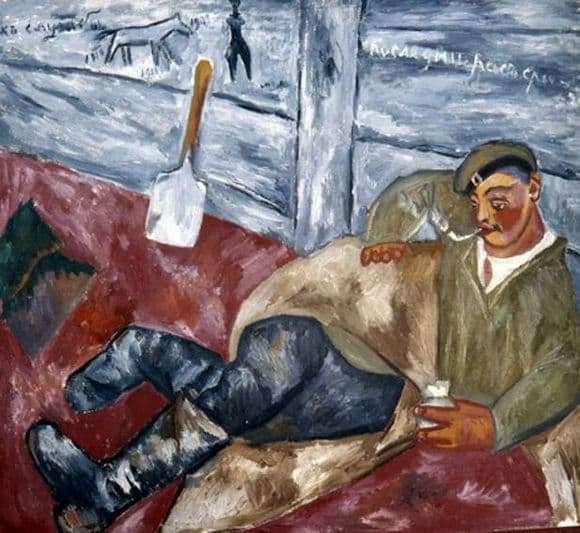 One of the most famous and central paintings of this series was the “Resting Soldier”, created in 1911, and today occupies an honorable place in the State Tretyakov Gallery. The work is written in the spirit of “naive” art – a simplified composition, deliberate distortion of proportions, the predominance of saturated, bright colors. The picture is a challenge and a desire to demonstrate a new perception of the surrounding reality. And let, many accused Larionov of cynicism and vulgarity, he became a true and authentic artist of life and its animal foundation. The master denies academic canons that do not reflect the forms and plots that are familiar to the eye, which is why audiences and art have moved away from each other. The whole image of a soldier is filled with irony. Larionov compares it with “resting Venus.” Unnaturalness and brokenness of a pose is a mocking sending in the direction of compositions with reclining naked natures. By the way, the image of “Venus” is noticeable among the wall drawings. Expressive colorful strokes are contrasted by the conventional refined color palette. But all together – the lack of plot and tough color solutions – generate harmony and amazing liveliness and rhythm of the entire composition. The approved negligence of performance brings the image closer to the folk forms of painting and the everyday genre.